Source Pool (Riverine) is an elemental contemplation of our transitory interrelationships with water. This site-specific installation was realized within the Rouge River watershed in the historic village of Unionville. Humans and wildlife have always lived in close proximity to water for essential refuge, sustenance, navigation and healing—both physical and psychological. 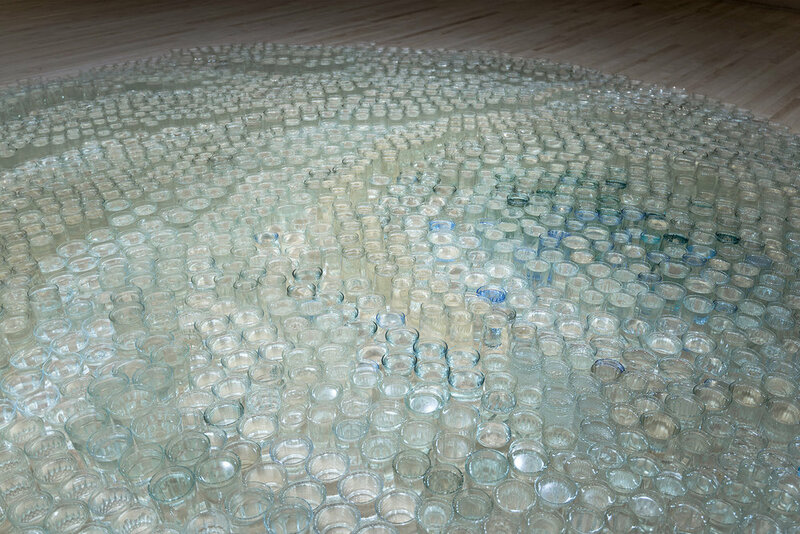 Reflecting on the notion of water as culture, creek water from a tributary of the Rouge River flowing beside the gallery was hand-collected to fill a matrix of over 2,600 salvaged pieces of glassware, forming an ethereal anthropological aquatic garden. At the end of the exhibition, the remaining unevaporated water was returned to its source. The gathered water was only temporarily diverted off-course for this terrestrial interlude; an interior visitation before continuing its path downstream. Science suggests water is as old as the Earth itself. Continuously in motion, the water that humans and all other freshwater-dependent organisms consume every day is thought to have circulated from the land to the sky and back again since the beginning of time. We are made of water and much of living relates to replenishing our physical and psychological geographies with this extraordinary substance. 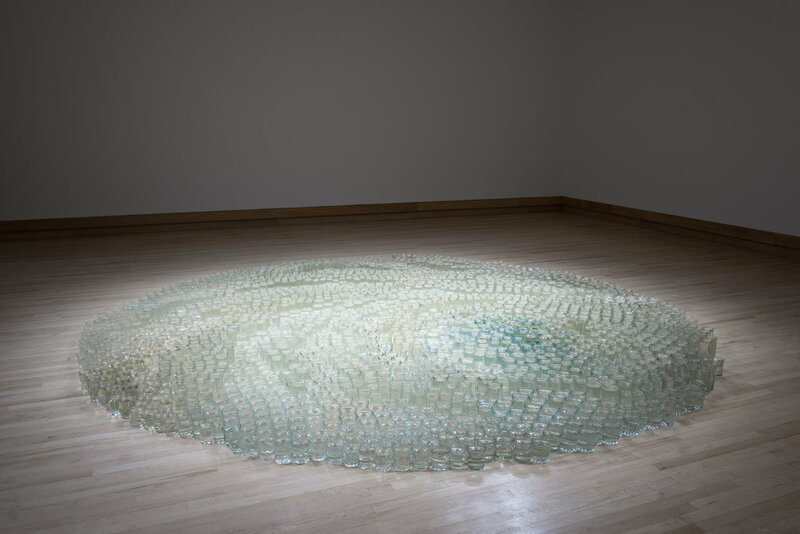 Evoking a cellular structure, the installation of creek water is supported by an undulating substrate of household glassware. Like the sediment-laid beds of Ontario’s creeks and rivers, and more specifically the sandy loam foundation of the Oak Ridges Moraine from which the Rouge River headwaters flow, the elements of mineral and water have coalesced over millennia. Glass itself is mineral in origin, an ancient material produced from silica sand. The glassware here are familiar contemporary cultural artifacts salvaged by the artist and donated by individuals across southern Ontario over several years. Each glass vessel has been touched by many people over time—repeatedly and almost ritualistically held up to mouths for drinking over untold years and decades. The work is suffused with the histories of those human-object interactions; highlighting the enduring primordial interrelationship between the water we consume every day and water bodies of the landscape. Source Pool (Riverine) is part of an ongoing series of atmospheric water installations that contemplate water bodies as liminal spaces. Each “pool” is envisioned as a dynamic landscape that retains a mystery—a kind of mythic portal to distant pasts at the threshold of a timeless sense of equilibrium. Through these “reflecting pools,” Abel seeks meditative, site-sensitive understandings of place and time.